This post was featured on the Huffington Post sports section on Saturday, Sept. 22, 2012. There is no reason for the Clemson Tigers to board the buses to Tallahassee, because they have no chance of winning in Doak Campbell Stadium Saturday night. The Tigers and Noles are set to show the nation how good the ACC can be as the teams take center stage in an 8 p.m. game on ABC Saturday night. Do the Tigers stand a chance or should they just stay in South Carolina? Let’s take a look at how the two teams match up. The Seminoles have the number one defense in the country after allowing only three points in three games. The Seminoles return nine starters on a defense that was ranked in the top-five a year ago, and can stake claim to the top defensive line in country with the talents of Everett Dawkins, Bjoern Werner, and Cornellius Carradine. Werner leads the country with six-and-a-half sacks this season and Carradine isn’t far behind with three-and-a-half. The Noles are only allowing 70 yards through the air and 34 yards on the ground. The defense is without a doubt the strongest unit on the FSU squad, but the offense is no push-over, averaging just over 52 points per game. The offense is led by senior quarterback E.J. Manuel, who has completed 71-percent of his passes for 525 yards, six touchdowns, and one interception. As much of a threat as Manuel is to run the ball, the Nole offense starts with running back Chris Thompson, who has carried the ball 18 times for 254 yards and three touchdowns. Thompson rushed for 194 yards a week ago against Wake Forest, all in the first half. At wide receiver, Florida St. is led by Kenny Shaw and Kelvin Benjamin, who have two touchdown receptions each. For all the talk of FSU’s talented defense, the Clemson Tigers have quite a few playmakers on the offensive side of the ball. The Noles will have a big decision to make in who to cover and who to take their chances on. The Clemson offense starts with junior quarterback Tajh Boyd, who has thrown for 747 yards, six touchdowns and one interception and has rushed for 75 yards this season. Against Auburn in week one, Boyd showed that he was plenty capable of keeping plays alive with his feet as well as getting the ball to his playmakers. Unlike week one, Boyd will have sophomore wide receiver Sammy Watkins in his arsenal of weapons. Watkins was a freshman All-American who had 1219 yards and 12 touchdowns last year, but was suspended for the first two games of the season. To complement Watkins, Boyd can also play toss-and-catch with Nuk Hopkins, who already has four touchdowns and 319 receiving yards. Not to be left out is running back Andre Ellington, who made spectacular runs against Auburn and has rushed for 328 yards and four touchdowns. If the Florida St. defense can manage to cover those three, the Tigers will simply get the ball to Jaron Brown, Brandon Ford, Adam Humphries Charone Peake, or Martavis Bryant, players who are all dangerous in their own right. The offense has kept the Tigers on pace, while the defense continues to be a work in progress under first year coordinator Brent Venables. Clemson is very young, but solid up front with tackles DeShawn Williams and Josh Watson. At linebacker, the Tigers have heavy hitters in Stephone Anthony, Tig Willard and self-proclaimed headhunter Lateek Townsend. The Tigers will need to stop FSU’s rushing attack and get solid play from the front seven to allow the secondary to settle in and prevent the long play when Manuel decides to throw the ball. Venables has proven over the last two seasons – he was at Oklahoma before coming to Clemson this season - that he is plenty capable of game planning against the Noles and stopping Manuel and offense. If Venables can translate his knowledge from the Sooners to the Tigers, then Clemson has a shot to emerge victorious. But, the Tigers must not allow the big, chunk plays that have plagued them throughout the first three games of the season. CLEMSON OFFENSIVE LINE: The Clemson offensive line has been pieced together for much of the season and the original starting five have not played together since the next to last play of the Auburn game. But when they were together, they were successful at opening up rushing lanes and giving Boyd ample time to find his playmakers. The line will have a difficult task in handling the front four on Florida State’s defensive line. The offensive line will have to protect Boyd long enough for him to get rid of the ball or extend plays with his legs. The Clemson line has three new starters, but center Dalton Freeman and right guard Tyler Shatley have a toughness about them that has been missing from the Tigers’ front for many years. FLORIDA STATE SECONDARY: The Clemson offense has so many weapons at wide receiver in Hopkins, Watkins, Humphries, Bryant and Brown, and for the FSU defense it almost becomes a ‘pick your poison’ type of deal. If Florida State defensive coordinator Mark Stoops decides to double-team Watkins, Hopkins is plenty capable of racking up 100 receiving yards and multiple touchdowns on his own. Defensive backs Xavier Rhodes and Lemarcus Joyner will be tasked with keeping tabs on the Tiger’s receiving corps, and if they can’t do it alone, FSU will be forced to drop a linebacker into coverage, which could ultimately open up the running game for Ellington and company. CLEMSON OFFENSIVE SNAP COUNT: The Clemson Tigers are averaging just over 79 plays per game, while the FSU defense has only been on the field for 162 plays over the course of three games. If the Tigers can run at least 80 plays, they will have an advantage over the Noles on a hot and humid night in Tallahassee. Many will make the claim that Florida State’s defense should be well-rested and fresh, but playing in the heat against an offense that likes to snap the ball with 25 to 30 seconds remaining on the play clock can take a toll on a defense that has yet to play an entire game. The Seminoles will come out with a lot of energy on defense, and will hold the Clemson offense in check for the first half, while the Clemson defense will give up yards, but keep the Noles from racking up a ton of points. 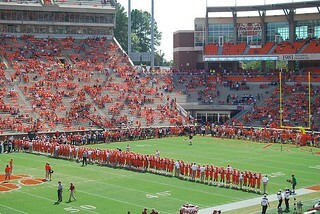 Going into the second half, the score will be close, but a FSU defense that hasn’t been tested and hasn’t played four quarters of football will begin to tire towards the end of the third quarter and the Tigers will put the game away to win a game that nobody outside of Clemson gave them a chance of winning. Yeah.... never mind Clemson's weak defense is going to be their achilles heal. And Wake Forest DOES run basically the same type of offense that Clemson runs as well, just with less athletes. And don't think for one second that FSU defense "will tire". These boys are well condidtioned and keep a good rotation of players in the game. Better hope Clemson can stop FSU's offense is they want a chance to win. Never mind Clemson BARELY won last year with most of the FSU starters hurt and a freshman in at QB. Clemson lost, bats off to Clemson for playing a very tough and disciplined game. I was at the game last night and the Tigers were impressive. Good luck with the remainder of your year. See you next year. oops. Hats off to Clemson, not "bats" off.